ETX Brewing Co. has brought new life to Downtown Tyler and participates in all of the downtown promotional activities. They continually support and donate to the City of Tyler’s downtown venues such as Liberty Hall, Gallery Main Street, the Tyler Public Library and the East Texas Symphony Orchestra. 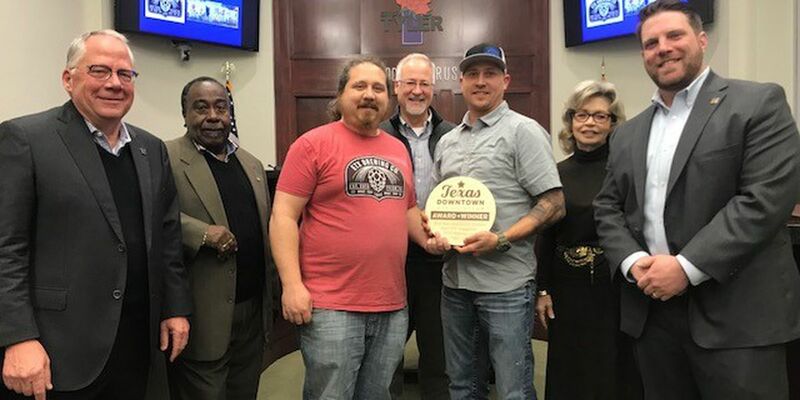 TYLER, TX (KLTV) - The Red Dirt BBQ & Music Festival and ETX Brewing Co. were recognized Wednesday morning by the Tyler City Council for their place among the outstanding projects, places, and people of Texas. There were 111 entries submitted in eleven different categories from communities across the state. Judges reviewed entries online and then met in person to make their final selection of award finalists and winners. ETX Brewing Co. has brought new life to Downtown Tyler and participates in all of the downtown promotional activities. They continually support and donate to the City of Tyler’s downtown venues such as Liberty Hall, Gallery Main Street, the Tyler Public Library and the East Texas Symphony Orchestra. ETX Brewing Co. hosts a monthly game night fundraiser for the Tyler Public Library and Meet and Greets prior the Symphony’s concerts. ETX Brewing Co. offers a venue for local artists, performers and musicians, featuring exhibits from a different local artist each month to open mic nights each week. They organized a recent calibration of local artists to paint an extremely large mural on their building featuring local wildflowers and the message “Be Happy”. It has become a favorite photo spot and added much beauty to Downtown Tyler. The Red Dirt Barbeque and Music Festival held every year in May on the grounds of Tyler’s historic downtown is an amalgamation of two of Texas’ most cherished traditions: amazing barbeque and fantastic music. Red Dirt brings thousands of people from across Texas and neighboring states to enjoy the finest Texas barbeque and music Texas has to offer. Red Dirt is also a celebration of Tyler’s historic downtown area, and attracts thousands of non-Tyler music and bbq lovers to enjoy everything that makes Downtown Tyler unique. The Red Dirt festival is a celebration of Texas food and music culture that attracts both Texans and non-Texans alike and creates one large community event that transforms the Downtown area. This event brings thousands of people to the Downtown Tyler who normally would not visit it, and they are able to see how vibrant and beautiful the historic downtown district is.